A dictionary, sometimes known as a wordbook, is a collection of words in one or more specific languages, often arranged alphabetically, which may include information on definitions, usage, etymologies, pronunciations, translation, etc. or a book of words in one language with their equivalents in another, sometimes known as a lexicon. It is a lexicographical reference that shows inter-relationships among the data. Joseph Emerson Worcester was an American lexicographer who was the chief competitor to Noah Webster of Webster's Dictionary in the mid-nineteenth-century. Their rivalry became known as the "dictionary wars". Worcester's dictionaries focused on traditional pronunciation and spelling, unlike Noah Webster's attempts to Americanize words. Worcester was respected by American writers and his dictionary maintained a strong hold on the American marketplace until a later, posthumous version of Webster's book appeared in 1864. After Worcester's death in 1865, their war ended. Webster's Third New International Dictionary of the English Language, Unabridged was published in September 1961. 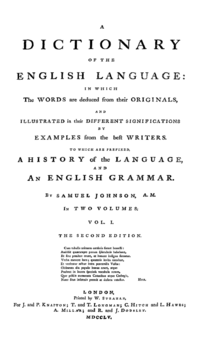 It was edited by Philip Babcock Gove and a team of lexicographers who spent 757 editor-years and $3.5 million. It contained more than 450,000 entries, including more than 100,000 new entries and as many new senses for entries carried over from previous editions. Reverend Thomas Dyche was an English schoolmaster and lexicographer (probably) from Ashbourne, Derbyshire. He published a number of books on the English language including one thought to be the first English book published in Asia. He is remembered for his reference books and his contribution to pronunciation. Dyche's New General English Dictionary was in print from 1735 to 1798 and went through eighteen editions. Benjamin Martin (1704-1782) was a lexicographer who compiled one of the early English dictionaries, the Lingua Britannica Reformata (1749). He also was a lecturer on science and maker of scientific instruments.